Product #21461 | SKU 13000377 | 0.0 (no ratings yet) Thanks for your rating! The small yet powerful black TT1-A Active High Output 2-Way Speaker from RCF is suitable for almost any sound reinforcement situation: live sound situations, playback, and monitoring. It is a compact, active loudspeaker designed specifically for high-quality indoor and outdoor near-field sound amplification. It is equipped with 800W digital amplification of which 550W is delivered from the low-frequency amplifier and 250W from the high-frequency digital module. 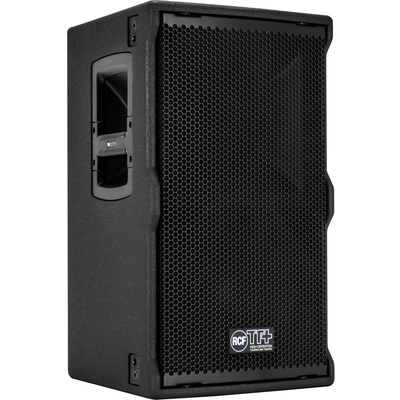 The TT1-A Speaker produces high-impact and high-definition sound projection that is expected in professional PA applications. Its wide-angle projection of 90 x 60° with the use of a precision waveguide makes audience coverage easy in a variety of situations. The 2-way speaker features a neodymium 3” voice coil compression driver on a large, constant directivity precision horn and a 10” hyper-vented neodymium woofer also with a 3” voice coil. The integration of 800W, 2-channel digital amplification and advanced digital processing sets a new standard for distortion, noise, and thermal efficiency. The speaker is equipped with an input board that features XLR in/out, gain reduction, time delay, speaker presets, RDNet ready option, RDNet bypass switch, 4 status LEDs, and powerCON in/out. It also features 96 kHz, 32-bit DSP processing and a dedicated networking board. By using RCF’s RDNet protocol, it is possible to monitor all the system parameters, form the input to the status of each single amplifier. A multifunctional rear encoder allows you to easily control all the speaker functions (gain reduction, delay, speaker presets), even without network connection. Foam-backed grilles hide the drivers from view for pleasing aesthetics. The speaker is equipped with a complete set of integrated rigging mechanics for rental applications or permanent installation. Two independent digital amplifiers, 550W for low frequency and 250W for the high frequency driver, deliver an astonishing output power, making the TT1-A a powerful 2-way module. These class D amplifiers offer hi-fi sound, low distortion with negligible quiescent noise, and stable burst response. The amplification module is housed in a separate chamber and mechanically insulated from the cabinet vibration for maximum reliability in long time operation. Thanks to the efficiency of the amplifiers, no fans are needed for quiet operation of the speaker. The 32-bit, floating point digital signal processing at 96 kHz takes care of 2-way system crossover and transducers alignments, 8 programmable system equalization, programmable output time delay, input sensitivity reduction, soft limiter and gentle compressor for high signal inputs, RMS current monitoring and transducers protection, and input noise reduction. A specially developed algorithm takes care of the frequency-dependent soft limiter, offering to the listener the same linearity of the system from very low level signals to the maximum output of the amplifiers. A dedicated processing area is available through the RDNet input board (sold separately). You have many options available on RDNet, including remote monitoring, special custom equalizations, high and low pass, single way solo and mute, and many other options. The rear panel features a simple rotary encoder to control all speaker functions. A bright 7-segment clear display helps in changing the settings of the system. The only switch on the panel allows you to set to local or remote control. A simple command from RDNet totally disables the input panel (to allow you to take exclusive remote control of the speaker). The HF transducer is a high-performance, 3" diaphragm compression driver with a 2" exit throat featuring several technologies. RCF has developed an oxygen-free process of molding pure titanium ultra-thin films in high-quality and finely controlled shaped diaphragms. This process offers superior sonic quality, extended to the highest audible frequencies, which guarantees consistent power handling and reliability. The diaphragm and suspension are precision formed from 0.002" (0.05mm) thick pure titanium. At the point where the titanium suspension is bonded to the assembly ring, a special dampening adhesive has been applied in order to further reduce and eliminate distortion creating resonances. The voice coil assembly is designed using a high-strength, high-temperature Kapton voice coil former and a rectangular profile copper clad aluminum wire, and is assembled using specially formulated adhesives. Proprietary curing processes ensure assembly strength and safe operation even under extreme thermal conditions. The top of the former is bent and bonded directly to the edge of the titanium diaphragm, resulting in a Direct Drive configuration. Direct Drive ensures optimal transfer of energy between the voice coil and the dome assembly providing smooth, extended frequency response beyond 10 kHz, reducing break up modes and lowering distortion. This assembly delivers high power handling along with great mechanical and thermal properties that make the compression driver reliable and robust. The TT1-A's mid bass transducer is designed to provide great frequency response linearity with very low distortion. A strong neodymium magnetic structure ensures precision, and a 3" voice coil design provides high power handling. The dual-forced air venting system ensures efficient voice coil ventilation to minimize the power compression and provide high power handling. The speaker uses a voice coil that combines the advantages of inside/outside technology and the quality of polyimide-imide materials (wire resins and formers resins). This inside/outside coil offers many advantages: the dissipation surface and adhesion area to the former is doubled. During thermal expansion, the former is squeezed between inside and outside layers, offering optimum mechanical resistance. The inside/outside formers are made from polyimide-imide fibreglass and the area between the coil and the cone is a triple layer of Nomex-fiberglass-Nomex for optimum stiffness and accurate sound transfer. The TT1-a is the result of an advanced acoustic design, state of the art digital power amplifiers, and a group of innovative processing algorithms that, running at 96 kHz, take care of the speaker's linearity and its dynamic control. Modern construction materials result in mechanical weight ratios that are light for practical flying and portability. The cabinet is made in high-quality Baltic Birch plywood with every layer glued with special adhesive that makes the cabinet completely water-resistant even before the painting process. Special polyurea paint is used to create a very thick, full coating of the cabinet, making it highly resistant to scratches and bumps. The internal structure is heavily braced to survive long term use and transportation and all the parts are assembled on metal inserts with metric screws. On the top and bottom of the cabinet, 2 large metal brackets are integrated for safe rigging day after day. The cabinet features 2 die-cast aluminum side handles powder coated and with a rubber hand-grip. Thanks to the internal scoop design, it is possible to use the handle in 3 different directions to facilitate the transport, positioning, and loading operations. The speaker offers many rigging possibilities: Top M20 insert; pole mount on the bottom; top and bottom fly tracks (6x); side quick lock pins (4x); side M10 rigging points (4x).